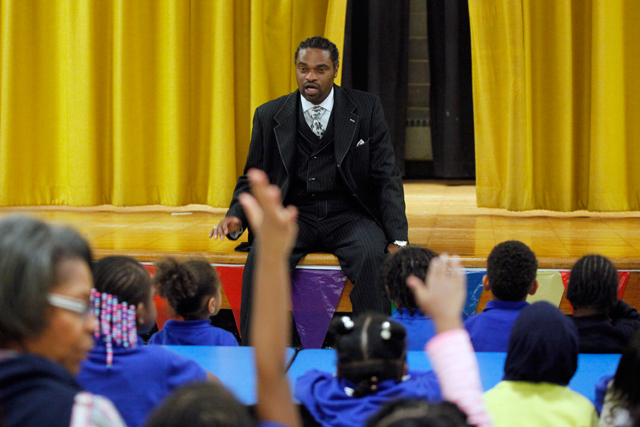 NEWARK, N.J. — The scene could have come from any school principal’s dream, but there it was before Erskine Glover’s eyes, happening in reality. 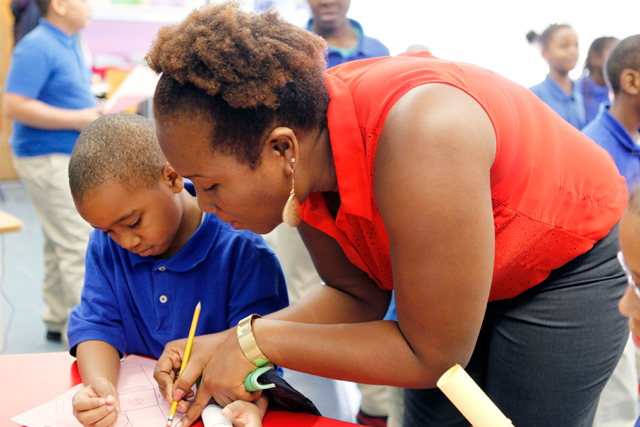 It was the first day of the 2014-2015 academic year at Quitman Street Renew School. Students and teachers were crowded into the combined cafeteria-auditorium, and Glover’s boss, Assistant Superintendent Peter Turnamian, was on stage. He was there to congratulate them. Of all 45 elementary and middle schools in Newark, Quitman had the greatest test score gains in reading the prior spring. 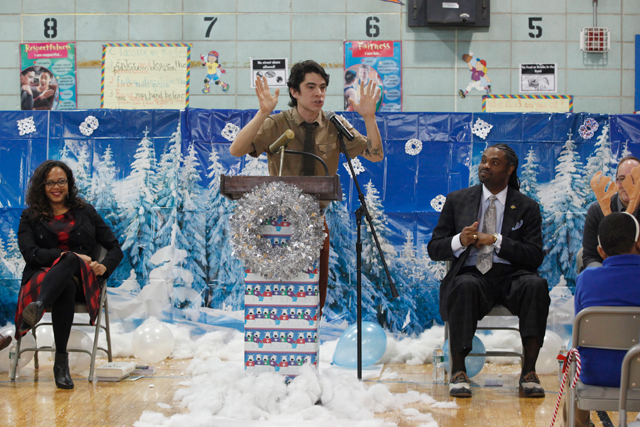 Its math improvement was tied for fourth-highest in the city. Minutes earlier, Superintendent Cami Anderson had also lavished praise on Quitman and other schools striving for turnarounds at a press conference in the Quitman library. A “Celebrating Student Success” banner was behind her, and the state education commissioner was at her side. Anderson was looking for good news on a day when her new school assignment process was under heavy public attack, but of all the places in Newark she could have gone to find it, this was where she turned. In November, Glover had another dream-like moment when a prominent education technology blog published a list called “100 Schools Worth Visiting.” And there was Quitman — long confined to the rungs of New Jersey’s lowest-performers — at No. 19. 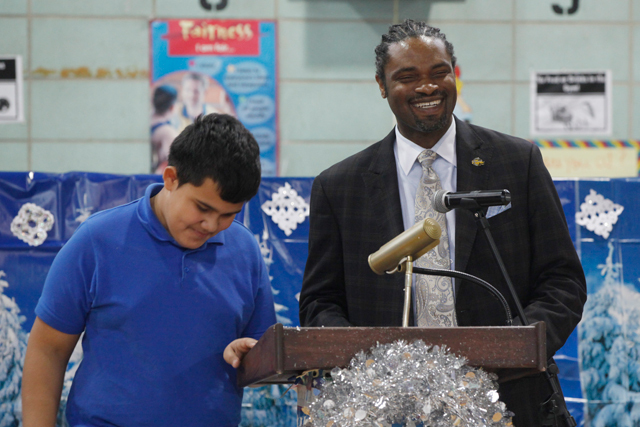 “Quitman Elementary School in Newark is making good strides in a tough place,” the post said. The local news ran an article about Quitman’s recognition, and the city schools’ advisory board passed a resolution of praise. Could it be? For four years since taking the helm of Quitman, Glover had been doing everything in his power to shed the school’s losing reputation, working himself to exhaustion with 4:30 a.m. alarms and untold missed family dinners — and building a staff willing to do the same. He pushed himself to continue after having his left hip replaced two summers ago and his right hip resurfaced a year later. He was in bed recovering from his first surgery when he got the news that the 2013 test scores were again rock bottom, and Turnamian had to talk him out of resigning. But, yes, two and a half years into a turnaround initiative that gave Glover hiring power and more resources, Quitman has turned a corner. The culture is significantly improved, the staff has stabilized, and classrooms generally are filled with students who are not only working but actually learning. At last, grueling effort has translated into test score gains at a school serving poor, minority students and a continually increasing number of children with learning and emotional disabilities. Perhaps most important, there has been a psychological shift here: It now seems possible for Quitman students to achieve excellence and realize the dream of economic prosperity. Still, there’s a long way to go. Despite the gains, scores on the New Jersey Assessment of Skills and Knowledge (NJ ASK) remain an embarrassment to Glover, 45, who is often his own worst critic, and are painfully low by any standards. The state reported 2014 pass rates ranging from 14 percent in eighth-grade math to 64 percent in fourth-grade science. In reading and math, no pass rate exceeded 40 percent — even lower than prior years, but the tests had gotten more difficult. District officials’ conclusion about Quitman’s improvement came not from pass rates but raw numbers. NJ ASK is scored on a scale of 300 points, and 200 is passing. Quitman’s average reading score for all grades tested went from 175 to 183 this year, a bigger jump than any other school in the city. In math, the school went from 173 to 181. In other words, many students are creeping closer to the pass mark, but they aren’t there yet. Quitman is testament to the fact that school reform done honestly takes a long time. A spike in scores tends to be the last piece to come, after strong leadership and instruction are in place. Nationally, many teachers and administrators don’t want to work under circumstances that require self-sacrifice and constant outside scrutiny. This school year, that’s true literally. Last spring was the final administration of NJ ASK, and now, New Jersey students are preparing for a much harder test to measure their knowledge of the national Common Core education standards. Glover is proud of his students’ improving analytical skills as they learn Common Core standards in their classrooms, but he worries about their ability to show what they know in the time allotted for the new exam. Quitman also started over this year with approximately 100 additional students as a result of the city’s new school assignment plan. And for the third consecutive year, district officials have steered more special education students to Quitman because they believe they will get good services there. In November, the school received a new class of students with behavioral disabilities, the most difficult population to manage. Enrollment remains in flux; as of mid-December, it was 667, up from 493 when the turnaround process began. Most grades added new classes so class size did not increase. Many of the new kids arrived with academic deficits and some aren’t used to a school culture that is focused and positive; one administrator often reminds longtime students to show their new classmates how to “behave like a Quitman Peacock.” But Glover is thrilled to see parents choosing his school. In most cases, it was one of families’ top three selections, and at the very least, parents are not pulling their children out. That is moving toward exactly what he wants: for Quitman to be in as high demand as Newark’s top-performing charters. “We’re finally at the table,” he said. Turning around a failing school is one of the hardest jobs anywhere, and despite much national attention to the problem, few places have done it successfully. Starting a new school without historical baggage is far easier, which is why many cities, Newark included, have adopted the divisive strategy of closing the lowest performers and beginning fresh. That has given a major opening to charter schools, public schools that operate privately. But Newark has too many low-performing schools to close them all, and in 2012, Superintendent Anderson targeted eight to try to put the past behind them. These “renew schools” had the option to change their names, but parents didn’t want to, and Quitman Street Community School simply became Quitman Street Renew School. The school opened in 1963 in a new three-story building at 21 Quitman St. that replaced an old school torn down around the corner. It served families in new public housing towers and old tenements in the city’s Central Ward, once a bustling working class Jewish enclave. Those days were fading, and Quitman’s student enrollment has always been predominantly African-American. When race riots tore through Newark in July 1967, the National Guard stormed into Quitman and evacuated all white staff members working in a summer kindergarten preparation program. The school closed for three weeks in 1970 and 11 weeks in 1971 during teacher strikes, the longer one racially polarizing. Through the years, a distinguishing characteristic of the school was its variability. Former staff, students and community members remember it differently, largely based on the strength of the principal at any given time. That fluctuated greatly, and so did the quality of teaching from one classroom to the next. For a while in the 1970s, the school had success grouping students by ability level, according to longtime teacher Harriet Knevals, so smart kids weren’t held back and their struggling peers could get extra attention. There was a brief merger with a since-closed school next door for students with behavioral disabilities. Sixth- through eighth-graders were transferred elsewhere and brought back. There were years when students came from all over the city, as they do again now, and years when everyone came from the same four public housing towers, only one of which is still standing. Early days when the building was filled to capacity with more than 1,500 students and nearly 40 students in some classes gave way to plummeting enrollment. In 2000, Turnamian — now the assistant superintendent — founded one of Newark’s first charter schools in the Central Ward in part to give families an alternative to Quitman, by then well-established in its reputation for violence and instability. Glover arrived as principal in 2010, having worked his way through the ranks of Newark Public Schools as a sixth-grade teacher, math staff developer, technology coordinator and assistant principal. His first two years, he was required to keep teachers who were not producing results, and a threat of closure was a huge distraction. Hired by former Superintendent Clifford Janey, Glover had to re-interview for his job first when Anderson became schools chief and again when the renew school process began. In the summer of 2012, Glover used his new hiring authority to replace half the teaching staff. Despite hundreds of hours of interviewing, not all his choices turned out to be the right ones. Five teachers had quit before the 2012-2013 academic year was out, including the entire middle school math and science team. Glover has needed to make several new hires again each of the past two summers, but this year, about half of the 17 openings were new positions because of the enrollment increase, raising the size of the teaching staff to 66. This time, he was required to make most of his new hires from a pool of district employees looking for reassignments, but he’s generally happy with the team he has currently, and he’s accepted that staffing will always be a work in progress. He sees his challenge as building an institution strong enough to outlast any individual’s departure — particularly, one day, his. This year he seems newly invigorated to see that job through. Hanging in the school office is a T-shirt designed by staff members who did a walkathon for breast cancer. “We Don’t Quit, Man!” it says in red letters over a blue background. Glover nodded toward the shirt one day as he passed by. “We sure don’t,” he said. Another key reform has been more time, not only for students in the classroom but also for teacher training and collaboration. Quitman teachers get a $4,000 stipend to work an extra hour a day, four Saturdays a year and two weeks in the summer. Glover says the summer time is especially critical to acclimate new staff and set the right tone for an upcoming year. Teachers at most schools, in Newark and nationally, return each August or September only two days before their students. North Star Academy, a network of 10 charter schools in Newark that are among the most highly acclaimed in the country for reversing the achievement gap, sets a higher bar: New teachers get three weeks of training each summer, all staff get two weeks, and students return a week before the rest of the city. For the second half of August, the Quitman team set up shop in the cafeteria at the school next door, which is now an early childhood center, as custodial staff scrambled to prepare Quitman’s classrooms. On Aug. 28, with a week to go before students’ return, the cafeteria walls were blanketed in more than 70 pieces of white and yellow poster paper. Teachers had written everything from chapter summaries of the book “Failure is NOT an Option,” required staff reading, to the materials they need to teach specific instructional standards. Glover gave the group three minutes that morning to complete a 15-question survey on their work environment. (Timing tasks is important so not a moment is wasted. This is a strategy North Star uses with both children and adults.) Sixty-nine percent agreed or strongly agreed that their colleagues “have a culture of learning and collaboration by continuously seeking to grow their instructional practice.” Fifty-three percent said colleagues are “productive team players who contribute to a professional school culture.” Similar surveys in prior years had comparable results. Glover said he hoped to reach 100 percent in all categories by June. Next, he gave five minutes to do a sample problem from the new test replacing the NJ ASK. Called the Partnership for Assessment of Readiness for College and Careers (PARCC), it will be used in 13 states and administered online. Part A: A farmer plants 3/4 of the field with soybeans. Drag the soybean to the field as many times as needed to show the fraction of the field that is planted with soybeans. Part B: Type a fraction different than 3/4 in the boxes that also represents the fractional part of the farmer’s field that is planted with soybeans. That was a third-grade problem. In the days of NJ ASK, it would have shown up in fourth or fifth grade. Next came a harder example. It required knowledge of the term “rectangular array,” which not all the teachers recognized. (It refers to equal-sized boxes making up a rectangle.) Students were asked to write a multiplication equation using R for the number of rows in a rectangular array with 56 small tiles and seven tiles per row. Glover told them that this, too, came from the sample third-grade test. 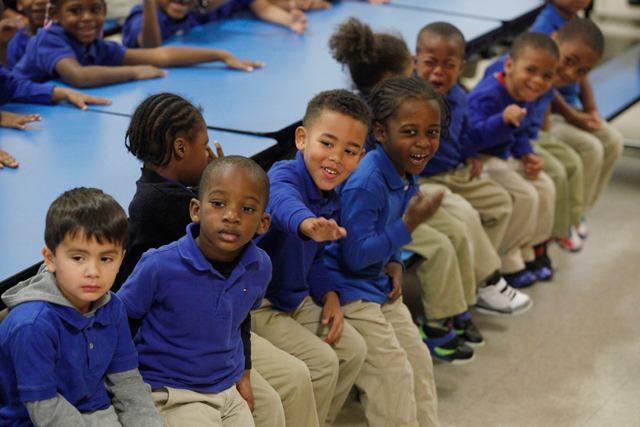 The principal asked all pre-kindergarten through second-grade teachers to stand. “You are the ones who need to make sure your students can do this problem,” he said. Even pre-kindergarten classes can talk about what a rectangle is and what the word “equal” means. Despite his unrelenting schedule, Glover couldn’t say no when he was recruited this fall to coach an 8-year-old boys’ soccer team in North Brunswick, the township where he and his family live. (He got involved coaching for the league when his now-17-year-old son started playing soccer at age 4, but he had never before led a team his son wasn’t on.) He initially said he was just filling in but ended up serving the entire season. He never finished work in time to make the 6 p.m. practices on Monday and Wednesday nights, and so he had soccer trainers hired to work with the children until he could get there at 6:45 or 7. He treated the 10 second-graders like professionals, analyzing what went well and what they could do better after every game. They ended the season 8-4. Glover hated losing as a kid playing basketball, and he still does. He is constantly breaking down Quitman’s performance like a coach breaks down a game to refine strategy. This has led to numerous changes at the school again this year. Each homeroom now begins the day with a “morning meeting” that helps address students’ social and emotional needs. School ends for students 20 minutes earlier, at 3:10 p.m. instead of 3:30. Reading and math are being woven into art, music and even physical education, with classroom teachers attending those subjects with their students. The move is an attempt to preserve instructional minutes while giving teachers an uninterrupted hour of planning time together at the end of the day, which Glover felt necessary to bolster collaboration. After-school tutoring this year is targeting the neediest students, versus last year when students in the middle were asked to stay. Of 169 struggling students invited, 123 enrolled in the after-school program, which runs at Quitman until 6 p.m. with YMCA employees offering arts, fitness and team-building activities. In the spring there will be swimming off site. The school expanded its use of blended learning, an exploding trend in education nationally because of its ability to personalize instruction. Last year, Quitman’s third through fifth grades piloted the initiative in reading and math, dividing a class into three groups based on ability for a particular skill. One group works with the teacher, the second works online and the last works individually or in pairs on assignments with old-school books, pencil and paper. Every 20 minutes in most classes, the groups switch stations. This year, Quitman brought blended learning to sixth through eighth grades and to science and social studies. Jackie Pugh, who helped Quitman design its blended learning program, has been impressed with the school. She works for Education Elements, a company that hosts a website where students can log on to find digital lessons Quitman purchased from many vendors all in one place. The company’s marketing director heard about the upcoming “100 Schools Worth Visiting” list, and Pugh recommended Quitman. A spokeswoman for the blog, run by former Bill & Melinda Gates Foundation executive director Tom Vander Ark, said that recommendation was how Quitman made the list. “They’re totally on top of everything they’re doing,” Pugh said. 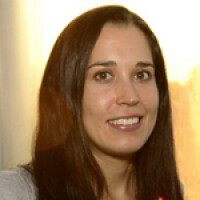 She also nominated vice principal Evelyn Vargas-Okparaeke to speak on a panel at a national education technology conference; although the proposed panel was not selected, it was still an honor for Vargas-Okparaeke to be recommended from the 118 schools that Education Elements works with nationwide. Blended learning, along with a districtwide emphasis on giving students extensive feedback, is a lot of work for teachers. Christina Patterson-Bright, a 20-year Quitman veteran who teaches seventh- and eighth-grade English, said the strategy of individualizing instruction is similar to what’s been happening in special education for decades. “We’re doing the exact same thing with 23 students that a teacher with a special needs class does with six,” she said. She said the model is extremely time consuming, “but we all want what’s best, so we do it.” She grades papers at her three sons’ sports practices and does lesson plans while cooking dinner. Data analysis has always been a strong suit for Glover, who was an undergraduate statistics major, and it was sorely lacking when he arrived at Quitman. One of his key hires has been Callie Franklin, whom he brought on in 2012 as the school “data coach.” Among many responsibilities, she analyzes student performance and works with teachers to tailor their instruction accordingly. She focuses her analyses on what the school can control, which is improvement. She’s most interested in how well Quitman has fared on the NJ ASK with students who have been there two years or more, which last spring was just over half the students tested: 161 kids in grades four through eight. Among those students, 68 percent showed growth in English and 48 percent grew in math. Franklin also broke down the scores by “significant growth,” students who jumped 10 points or more on the testing scale of 300. Forty-four percent made significant growth in English, 34 percent had significant growth in math and 31 percent had it in both. A breakdown of scores by classroom shows that 89 percent of Patterson-Bright’s returning students grew, and 75 percent showed significant growth. This reinforces Glover’s belief that great teaching matters. Related: Can handpicked teachers turn around an underperforming school? Jessica Allen, a dynamic fifth-grade math and science teacher who puts in hours even longer than Glover’s, fell short of her goal of getting 80 percent of her students to pass NJ ASK last spring, but 78 percent of those at the school two years or more grew. She didn’t know that, though. Glover did not have Franklin review the scores with teachers, telling them not to look back and focus instead on preparing students for the new exam, which will require completely different skills. But on internal midyear exams, Allen was not pleased. “It’s hard to look at a score when you know you tried so hard, and you know the kids have learned a lot, and it’s just not showing in the scores at the time,” said the Virginia native, whose third-floor classroom feels similar to a class at North Star with a combination of high behavioral expectations, focus and joy. She plays silly songs like “Boogie Shoes” so students can let loose switching from one blended learning station to another, even if she only gives them 10 seconds to get there. At the station where students do pencil-and-paper work, she maintains folders for each of the 50 students she sees every day with worksheets and games on the specific skills they answered incorrectly. The most important skill some of her students struggle with is reading, and the PARCC is filled with math word problems. “How are they going to answer the questions?” she asked. 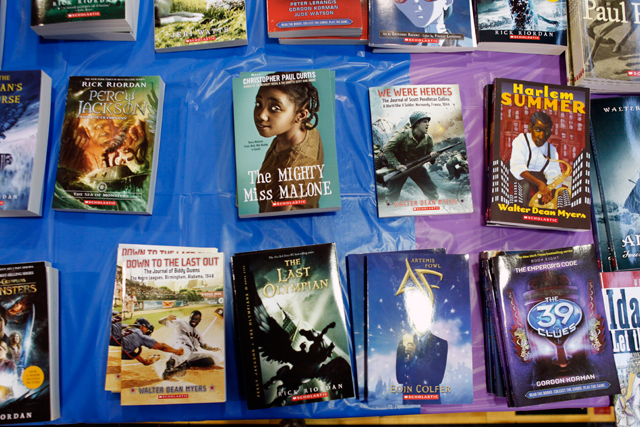 To recognize Quitman students for their test score growth, the district had a book giveaway at the school on Nov. 19. 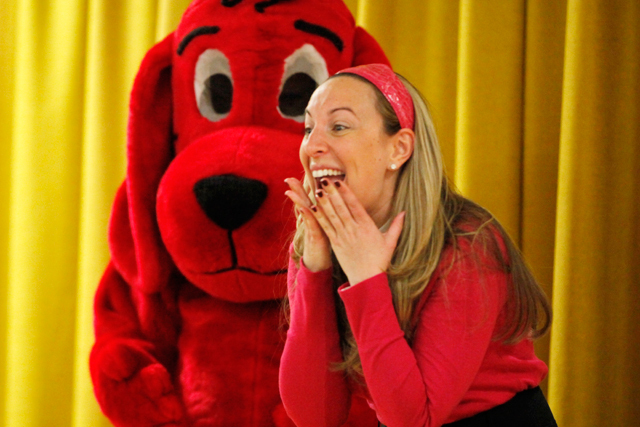 A Scholastic sales representative dressed up as the children’s book character Clifford the Big Red Dog, and a district math specialist donned striped knee-socks as Clifford’s owner, Emily Elizabeth. The pre-kindergartners shrieked for them. Kindergartners wore red and white “Cat in the Hat” hats. The books were set up in the gym, which middle school honors students had decorated with research projects about other countries. The words “Creating Global Citizens” were painted across a handmade poster of the world, fixed to the middle of the floor. In classrooms, students spent the day on grade-wide projects. Third grade, for instance, learned about communities, with different stations about politics, economics and transportation. Glover was impressed with what he saw when he dropped in. (He usually clocks four miles a day on his pedometer just walking around the school.) The third-grade instructional team used to be among Quitman’s weakest. No longer. But Glover is frustrated that there are still children arriving in third grade unable to read. In December, about half the classrooms showed substantial progress on internal midyear exams. He worried about the half that stayed stagnant. “You don’t ever want to be the school that shows some gains and falls back,” he said. Growing up in Rochester, N.Y., Glover learned how to navigate gang territories and had to worry about being robbed as he walked home, just like his students at Quitman. But he and his wife have raised their own two children in a very different environment. Thirty miles south of Newark, North Brunswick is a racially diverse suburb with a relatively low poverty rate. About a third of public school students qualify for free and reduced-price lunch, versus 93 percent this year at Quitman. Glover lives with his wife, son, daughter and mother-in-law in a four-bedroom house on a quiet, tree-lined street. He and his wife have been “pescatarians,” (vegetarians who eat fish) for health reasons since 1992, when they were college sweethearts at the University of South Carolina, and they have raised their children without meat. Yolanda Kennard-Glover trains probation officers and other law-enforcement officials at the Princeton campus of Rutgers University. The couple have five degrees between them — six if Glover ever finishes his Columbia Teachers College doctoral dissertation. On Glover’s commute, which takes 45 minutes on a good day, he passes strip malls, car dealerships and the main Rutgers campus before merging onto the New Jersey Turnpike. Exiting the highway in his silver Volkswagen Passat, Glover drives on potholed streets with decayed housing and fast-food joints. The blocks immediately surrounding Quitman have been redeveloped with public townhouses in the past decade, and with a new senior complex on the way, Glover expects increased police presence that will help give kids safe passage in addition to protecting the elderly. His son, Khamisi, was mischievous when he was little, and the principal often thinks of him when he sees students with similar antics. The boy has grown into a mature high school senior immersed in college applications and focused on competitive soccer. Because Khamisi is sociable and likes to please his peers, Glover knows he and his wife would have needed to worry more had they raised him in Newark, where young black males are all too susceptible to gang recruitment. Khamisi and his sister, 14-year-old Akilah, also have been raised in a house with both parents and a grandmother while many kids in Newark live with only one adult. 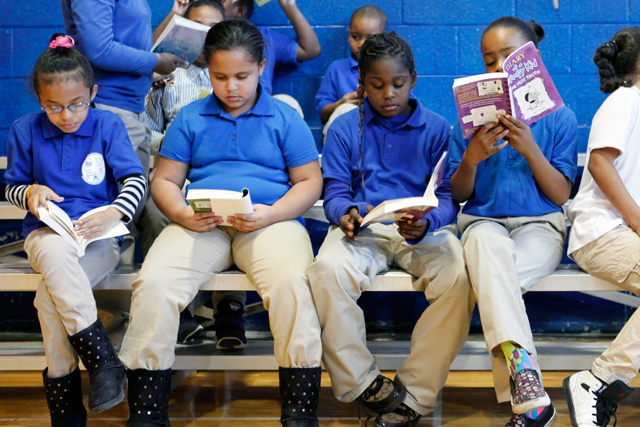 Newark and many urban cities are striving to improve student performance with personalized school environments. 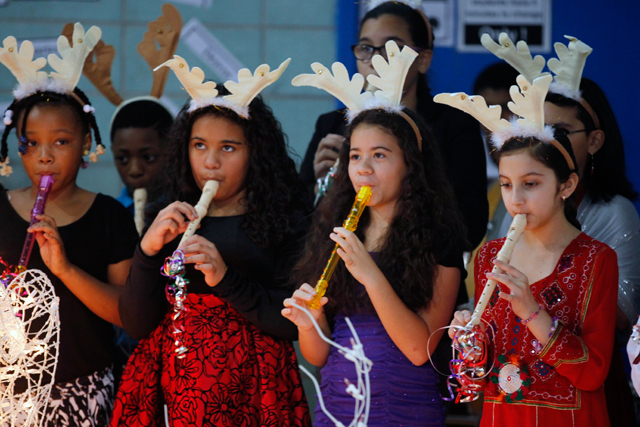 Newark’s middle school students stay in their elementary schools through eighth grade, and high schools tend to be small and specialized, with enrollment determined by an application process, not by neighborhood. The suburbs, meanwhile, have kept large zoned middle and high schools with a broader range of course and extracurricular offerings. In North Brunswick, everyone attends Linwood Middle School, with more than 1,300 students, and North Brunswick High, with about 1,800. Akilah, a quiet freshman who loves to dance, takes the bus there while her big brother gets a ride from friends. They can go days without seeing each other in the building. The Glover kids’ school day is the standard American 6.5 hours, and students do not go on as many college trips as peers in Newark, since the expectation is that their parents will take them. Khamisi recently sat in on English and psychology classes at Goucher College outside Baltimore while on a soccer trip and wondered whether he was ready. 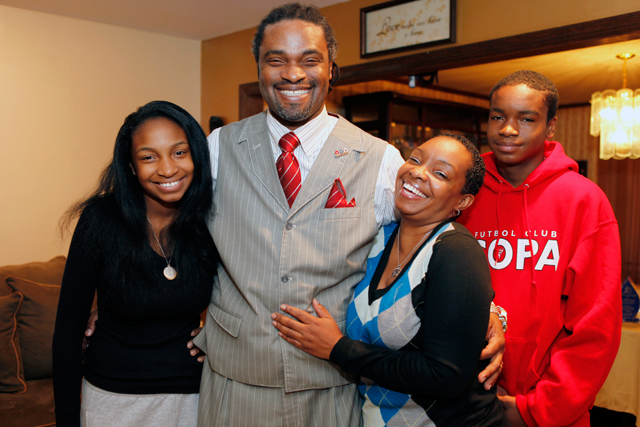 Kennard-Glover said both her children inherit their father’s self-doubt. Khamisi’s top choices are the University of North Carolina at Chapel Hill and at Greensboro. He’s thinking he might want to be a criminal lawyer or, at his father’s suggestion, have a career in sports management, but he isn’t really sure. Akilah is leaning toward dance teacher or business owner, maybe of a sneaker store. She is just one year older than the eighth graders at Quitman. For all the differences in their schooling and upbringings, they have a lot of similarities, hoping for a bright future and unsure what it will hold. Nayely Jimenez, 13, a Quitman eighth grader with long hair and glasses, has already started the Rutgers Future Scholars program, which will give her extra academic support through high school and pay her tuition if she chooses to attend the university. But she can’t say yet where she’ll want to go. “My friend is planning out her life. I’m like, ‘What? You don’t know what’s gonna happen,’” said the girl, who is interested in being an art therapist or a scientist. Her classmate Tyishina Kelly, 14, said in an interview last month that she wasn’t sold yet on college, especially if it would mean moving away from home. She was staying with her grandmother and her mother’s much younger brother, a 10-year-old Quitman fifth-grader. Tyishina said she didn’t know if she would be able to leave her mom, living in North Carolina, once they were reunited. “I just have to think over it,” she said. A few weeks later, she moved south sooner than planned. Another Quitman eighth-grader recently left when North Star had an opening, since attendance will guarantee him a coveted spot for high school. Glover has been feeling nostalgic lately that Khamisi is about to turn 18, on Jan. 9. Where did the years go? His wife was pregnant with their son when Glover took his first teaching job in Newark Public Schools. Now here he is at his senior soccer banquet, wearing a bow tie just like his dad. And his baby girl, whom he nurtured on his own for the first month of her life while his wife remained hospitalized with a pulmonary embolism, looks like a beautiful grown woman, taller than Yolanda and with features unmistakably like his. Yet the rapidly passing time in his own family makes Glover all the more mindful of how urgent his job is. He, too, wonders what the future will hold, but for however long he stays at Quitman, he will never let up on the intensity he imposes on himself. Turning around a school is a long process, but his window of opportunity to impact each life is so limited. A childhood is preciously short, and then the dream is over. This story was produced by The Hechinger Report, a nonprofit, independent news website focused on inequality and innovation in education. Read the entire Promise to Renew series about Quitman Street Renew School.